We hope you guys have enjoyed the rush of content on the web this week. We’ve seen a lot of great stories on our end as well. Foursquare releases its Swarm app (thereby separating its services), a new Gmail overhaul is in the works, and Pinterest commences its rollout of Promoted Pins. Catch up on some of the other news in the industry. 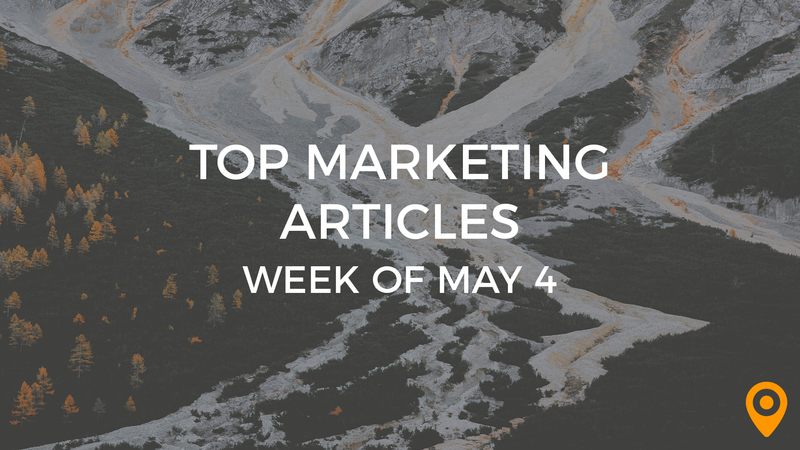 Videos, images, blog posts — we’ve got it all right here in this week’s top 25 inbound marketing articles of the week! How effective are you at Google Analytics? There are more ways than one to segment your visitors on the platform. Here are 70+ ways you can remarket to your audience using Google Analytics from Glenn Gabe. The better your SEO, the more likely your business is to get found. Still don’t understand SEO? Here is a helpful video from Rand Fishkin that will go in-depth on the subject. Let’s say you want to improve your search optimize as soon as possible. What are your first SEO tasks? Eric Enge provides a useful list on next steps to improve your SEO. Are you looking for a new keyword optimization strategy? David Cohen has you covered! Here’s his guide to using “colloquial” keywords to optimize the customer’s purchase journey. Let’s face it: YouTube comments aren’t the best infrastructure to cultivate a proper community culture. There are better ways to grow a tightly knit group of collaborators! Steve Benjamins writes an intelligent post on growing positive communities. Facebook marketing is still one of the top ways to market your business. In the market for some new strategies? Roel Manarang shares 16 effective Facebook marketing strategies for business! For all the great advice that exists on how to do social media right, there’s ten times more noise that comes with it. That ends right now! Keep an eye out for these 50 misconceptions about social media from Krishna Reddy. Listening to your social media is more than just a monitoring tactic. It’s a tool that can be used to create blog posts, find new keywords, and more! Learn the full potential of social listening from Valerie Levin in a strong blog post. Local business marketing is rapidly changing, and it’s up to business owners to keep up with the rush. Listen to this incredible podcast with Vicky Lyashenko, a local business owner, mother, and speaker by host Kalynn Amadio. Have you ever used Pinterest? If you have, you’re probably well aware of the local capabilities that exist on the platform. Ramon Ray present five ways to optimize for Pinterest Local Search. What does local marketing mean to you? It helps you properly market to local customers and more easily connect. Samantha Roach explains its significance and teaches us how to do it right. Why is email doing so well? The reason is that transactions are easier to make from a link in your inbox than a link on a website you’ve never been to before or a social profile. If you’re looking to jump on the email marketing bandwagon, here are five top tips from Niko Hoo. If you’ve been chugging along in your email marketing strategy, there’s a good chance you’ll want to find better ways to optimize it. Want more insight on your email messaging? Matthew Collis has three tips for email marketing (that can be applied across industries). Believe it or not, a lot of email marketing’s success can be contributed to the design of your email. Jason Rodriguez presents a guide on the code beneath your email message, asking whether email can be responsive. When creating a mobile app, there are several factors to keep in mind. How will you distribute your app? How will you promote it. Jayneel Patel discusses how to overcome five major problems in mobile app development. Make no mistake, mobile devices are growing more powerful than ever before. See how they’re integrating with social media in this insightful infographic from Somoglobal, presented by Irfan Ahmad. How do you improve the buyer experience? One way is to iterate on the navigation and design for a smoother UX. Tyler Burtchell is guest author of this post. Are you looking to improve social conversions? Try Snip.ly! Get an inside look at the tool from Brad Knutson. Facebook ads should be a part of your online marketing strategy if it isn’t already. Utilized correctly, they can be very effective. Francisco Rosales reveals his strategy in a smart post. Looking for tips on how to grow your site? You’ve come to the right place in this roundup, that’s for sure. Richard Marriott takes us through the process of how his site began receiving more than 500 visits a day and ranking FAST. Are you interested in how to map your content strategy? Heather Robson goes deep in a superb rundown of a content map for your audience. If there was ever a reason to do content marketing, this is it. You’ll learn everything you’ll need to know about content, thanks to the Content Marketing Institute. Lee Odden lists more than 100 B2B content marketing stats in an article. Still unsure on whether you should launch your content strategy? King Content posts a helpful Slideshare presentation on 20 questions you should ask before you begin! Every business is on the lookout for new clients. The wonderful thing about the Internet is that you can use social media to boost your reputation. Kristi Hines shares three ways you can use social reviews to bolster your online presence.